The message took her aback. It had been a while since she had made a cash withdrawal, and she didn’t recall having seen it before. BNB’s Interactive Banking Experience? Was that something new? She remembered reading a brochure included with her last bank statement, something that touted in bloated jargon the latest advances the BNB was bringing to their customers. The statement that her future was safe in the bank’s care caused her eyebrows to rise, but she had stopped reading when it claimed the changes would bring about faster, better and more enjoyable customer fulfillment. She had certainly never considered dealing with a bank to be enjoyable; furthermore, her fulfillment as a customer would only come when the tide turned, and her cash outflow ceased to surpass the amount that was trickling in. Never mind. She entered her security code and waited as the machine whirred into action. How much money should she try and withdraw? Would fifty dollars be too much, and how long would it have to last? She reminded herself to verify the balance in her account before closing the session, and then turned her attention back to the screen as it refreshed. “Cash withdrawal, of course,” she muttered under her breath as she chose that option. She did so, selecting fifty dollars and asking for a receipt. She rolled her eyes. Who were the bright lights that came up with this stuff? No wonder she couldn’t find a creative, well paid job, if this was what passed for innovative technology and creative thinking. Still it did not whir into life, as the rollers that usually spat forth bank notes remained motionless and silent. The screen was not blank, however, as it segued into a bewildering kaleidoscope of garishly coloured electronic forms. They swirled and rolled, expanding and contracting before finally resolving into a screen of new menu options. Startled, Megan stepped back and looked away from the machine. She closed her eyes for a moment, thinking that it was an illusion. She was hungry, tired, fed up and hoped that when she looked at the screen again, she would see her money waiting for her. All she wanted was to complete her transaction, get some food for supper and head home. Taking a deep breath she steeled herself, opened her eyes and looked; nothing had changed. There was no money poking out, and the new menu remained in place. Feeling as though she were capitulating to forces beyond her ken, she checked the options presented to her. “WHAT? !” she screamed aloud, and then looked around her, feeling rather sheepish. Her expletive attracted no-one’s attention. People were accustomed to oaths being hurled at bank machines, and they walked by as though all were normal. There was nothing for it but to do as requested. The command flashed over three graphics: a teacup and saucer, a deck of Tarot cards and the palm of a hand held up straight. Megan was in a quandary, not knowing what to choose. Her eyes went from one symbol to another, and then back to the written command. By now she had forgotten about the money, forgotten about the people passing by on the street, forgotten how much she hated the BNB and how she intended to spend her evening, should she ever make it home, searching for a new banking establishment to turn to. Anxiety about making the right choice swept over her. Fortune told, future read, fate revealed. Think, Megan, think! Fortune told, that would be the teacup, wouldn’t it? The future was read in Tarot cards, and palmistry revealed fate. She panicked, wondering if that was correct. Maybe it was the other way around; didn’t Tarot cards reveal fate, and palm reading told the future? The choice had to be made, and she chose the teacup. It seemed the easiest and safest by far, and didn’t have the sinister overtones she felt the other two carried. She touched the image on the screen and waited with bated breath for what was to come. Almost at once a new menu appeared. Without hesitating she chose Darjeeling, wondering if milk and sugar would be the next options offered to her. She could have used a good cup of tea by now, but shoved that idea aside. There was no point in being distracted with thoughts of material comfort; they would have to wait. Again the screen refreshed itself, and a very life like cup and saucer appeared in front of her. A pot held by an unseen hand poured out a steaming cup of tea and the effect was so life like that Megan was ready to believe it was real. She was startled to read a prompt above the cup: “Pick it up and drink it down.” Stunned, she reached out and her hand closed around the handle of the cup. Raising it to her lips, she felt the heat of the tea and inhaled its aroma. She drank it slowly, appreciative of its flavour. As she emptied the cup, a nest of leaves settled in the bottom. Careful not to disturb them, she drained the amber liquid and turned her attention back to the screen for the next command. With great care she did as instructed. After returning the cup and saucer she took a step back and watched closely. What had been a very real cup and saucer instantly lost its solidity and was once again a computer-generated image, which slowly dissolved, fading away. Megan’s gaze didn’t waver or leave the screen for a second. She couldn’t have said how long she waited before once again it came back to life with a new message. Without thinking she said, “Yes, I would,” and then realised how foolish she sounded. Before she could reach out, touch the screen and affirm her choice, it dissolved once again. When the screen came back to life, it returned to her withdrawal request, asking if she wanted it in denominations of five or ten. A sense of panic and confusion swept over her. Was she going mad? Had the Interactive Banking Experience actually happened? Whether or not it had, would she obtain her money, complete the transaction, get her receipt and a record of the reading and finally be on her way home? Wearily, she decided she would take it in fives. It would be easier to eke out that way, she thought miserably. She made her choice and once again waited, thankful that the Interactive Banking Experience was over and done with. It was not, however, as instead of ten crisp five dollar banknotes rolling out towards her, an avalanche of packages spilled into the slot that formerly held the teacup. Stunned, she scooped them up and looked at them. They were an assortment of various snack foods; bags of potato chips, cheese twists, biscuits, chocolates, cookies and the like. Each bag weighed five ounces, and there were ten of them. Ten bags weighing five ounces apiece, for a total of fifty – ounces, not dollars. Her eyes went back to the machine. A slip of paper protruded. Grabbing it, she saw it was the printout of what had been predicted for her. Reading it, she did not know if she should laugh or cry. The interactive banking joke would have been funny if it didn’t seem so cruel. 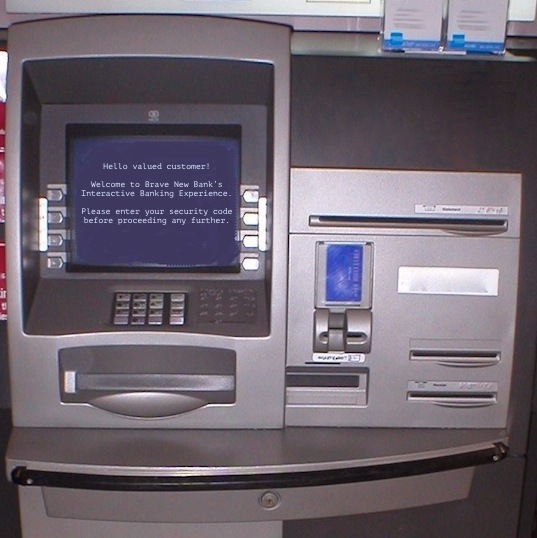 She wondered if the machine would still give her the money, but to her dismay it simply ejected her card before flashing the message: Closed for maintenance. She stuffed the ten packages into the market bag she carried with her and wearily trudged away. There was no point stopping at any shops now; she didn’t have a penny to her name. She would simply go home, make a cup of tea and see if anything in those packages was edible. To her relief it didn’t take long to get there. Her apartment was tiny, cosy, warm, and she soon had a steaming cup of tea prepared. She sipped it, grateful for its warmth as she settled onto her couch. The carrier bag was nearby and she started rooting through it. Finding a bag of biscuits she tore it open and munched on those while looking over the rest of what she now thought of as her “loot”. One package in particular attracted her attention. Bearing the brand name and logo of a well-known snack food guru, a banner was splashed across it, proclaiming that all she had to do was “open it to win”. Ripping the package open, she shook out the contents, looking for the contest rules. A small square of cardboard wrapped in cellophane appeared. The writing on it proclaimed that if she were to scratch the covering from three of the five circles and they revealed the same symbol, she would be the Grand Prize Jackpot Winner of – her eyes grew wide as she read the amount. She remembered the prediction of the tea leaf reading, and wondered if by some crazy twist of fate it would come true. If it did, then how the hell did she end up in this alternate universe, because it seemed more and more likely that that was where she was. What exactly had her fortune been again? The bit of paper was beside her and she read it again. She sat back and sipped her tea, grabbing another of the packets as she did so. It was a package of sweets. She started to laugh. A sweet reversal of her circumstances had indeed come to pass when all those packages appeared before her. Salty and sweet, come to think of it. Getting up, she took the square with the game on it and looked at it again. Should she play along, choose three of the five circles, scratch the protective covering and chance winning the jack pot? What were the chances she might come up with the winning combination, and if she did, how would it change her life? So far what had been predicted for her future wasn’t too far off the mark. What else had it said? Oh yes, a celebration would be in order, nothing would ever be the same for her again and she should not look back. It occurred to her that that was all very good advice; her fortune would be what she made of it. Slowly, deliberately, she tore the bit of card into tiny pieces. Holding them in her hand, she felt a weight lift from her shoulders. The lure of obtaining something for nothing had been enticing but uncertain; she would continue to fend for herself. For now, she needed a good night’s sleep. Tomorrow, she decided, would be the day she found a better job. Turning off the lights, she left the living room, went to bed and slept soundly. Epilogue: As it turned out, Megan’s fortune did come true in most respects. Before she even looked for a new job she took it upon herself to expose the Brave New Bank’s Interactive Banking Experience for the sham it was. The regulatory authorities came down hard on them and Megan was entitled to her share of the credit. Afterwards, various companies approached Megan, wanting to hire her as a troubleshooter. She had several job offers to choose from and was able to negotiate on her own terms. The reversal of her fortunes was indeed sweet, nothing was ever the same as it had been and if she occasionally looked back at what had happened, it was never with regret. This entry was posted in - Humor Stories and tagged allegory, banks, Cecilia Rogers, fantastical, fortune telling, humour, satire, win/lose by Select Stories. Bookmark the permalink. I liked this story and secretly wanted her to play the scratch off to see if she would win millions.